One doesn’t watch Rectify so much as one slides into it. The SundanceTV drama, which returns for a second season tonight at 9 ET, remains unlike anything else on television. The story of Daniel Holden, a young, potentially innocent man released after spending 19 years on death row, is molasses-slow, each frame radiating with the sticky, suffocating heat of its Georgia location. Where other series shout for your attention, Rectify drawls. I walk away from each episode not with lines of dialogue rattling in my head, but with sounds: the insistent chirping of the cicadas on the front lawn, the nauseating thunk of an old pistol dropped on a desk, the punishing silence of a solitary prison cell. 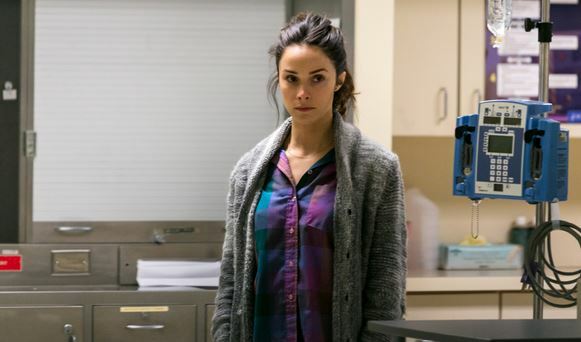 In its abbreviated first season — just six episodes, enough to qualify as a miniseries if a renewal didn’t come through — Rectify tracked the first week of Daniel’s freedom. Convicted of murdering his high school girlfriend under murky circumstances (he was high on mushrooms, other kids were around, even he isn’t certain of his involvement), Daniel (Aden Young) was as surprised as anyone to find his sentence vacated thanks to the tireless advocacy of his sister Amantha (Abigail Spencer) and her boyfriend, a liberal Atlanta attorney named Jon (Luke Kirby). While TV cameras mass outside and bitter neighbors whisper and plot, Daniel holes up in his childhood bedroom, his very presence making life excruciating and exquisite for the family he left behind — and the one that’s formed in his absence. During Daniel’s incarceration, his jittery mother, Janet (J. Smith-Cameron), married a local tire salesman, Ted (Bruce McKinnon), giving Daniel a half brother, Jared (Jake Austin Walker), whom he’s never met and, in the preening Ted Jr. (Clayne Crawford), a stepbrother who wants no part of this particular circus. It’s a feeling not shared by Ted Jr.’s sweet, religious wife, Tawney (Adelaide Clemens). She seeks to save Daniel even if it’s her own heart that’s most at risk. That this weightiness rarely feels burdensome is primarily a credit to the dynamic cast. Orbiting around the dense gravity of Young are some of the best performances currently on the air. I’ve already written at length about the brilliance of Spencer’s turn as Amantha, Daniel’s crusading sister. The complicated relationship between siblings is one that’s woefully underrepresented on dramatic television. And Spencer — cigarette in hand, boots on feet, snarl on lips — plays every wrinkle of Amantha’s confusion, resentment, protectiveness, and love. She’s too smart for this town and its terrible burden, but she cares too much to be anywhere else. On the other end of the spectrum is Crawford, who brings remarkable subtlety and dignity to a character — Southern, closed-minded, jealous — that could easily slide into caricature. (The mystery of just what Daniel did or didn’t do to him during a fight last season hangs over Ted Jr. like a rain cloud.) But Rectify doesn’t traffic in extremes. Thanks to to the delicate work of Australian actress Clemens, Tawney — the born-again naïf — is equally nuanced. It’s her unshakable devotion to Christianity that draws her to Daniel: She wants to forgive him, like Judas, and celebrate him, like Lazarus. But the depth of her feelings for him appears to emanate from a place untouched by God — or her husband. The first season of Rectify ended with the awful sight of Daniel being beaten into unconsciousness by a local gang led by the brother of his supposed victim. Tonight picks up at the hospital with Daniel, in a coma, dreaming of Kerwin, his long-gone best friend from death row played by the exceptional Johnny Ray Gill. Standing amid the tubes snaking out of Daniel’s body are his relatives, overcome with dread over what nightmare they’ll have to suffer next. It was a feeling I temporarily shared. Though I loved those initial six episodes, I was unsure of Sundance’s plan to extend the run indefinitely. Daniel’s story seemed too specific to be stretched, the pain running in two directions — the nightmare of Daniel’s past, the uncertainty of his future — too challenging to endure. After watching the first three episodes of the second season (there will be 10 total), I’m happy to report my fears were unfounded. The show that returns tonight is better than ever; its slowness and care strike me as even more distinctive and refreshing than they were a year ago. McKinnon has a big story to tell, but seems happiest dwelling on the smallest of details: Amantha and her mother bonding over a catalogue, Teds Sr. and Jr. struggling to microwave a frozen lasagna, Tawney’s face cracking like a stained-glass window. As the rest of cable TV adopts a blockbuster model, it’s a relief to find Sundance seeking shelter in the intimacy of the art house. Rectify is never easy. And that’s precisely what makes it so essential. Which Heartsick Track on the New Robin Thicke Album Will Win Back Paula Patton?